The new Fluke ScopeMeter®190 Series II 2-channel handheld oscilloscopes combine the power of a 2-channel oscilloscope with a 5000-count digital multimeter and paperless recording mode, creating an advanced test and measurement tool that service and maintenance professionals can rely on for troubleshooting equipment performance problems in the field. The 2-channel models join the recently introduced 4-channel ScopeMeter 190 Series II models to create the first full line of high-performance portable oscilloscopes with 2 or 4 independently isolated input channels, rugged sealed case, and CAT III 1000V / CAT IV 600V safety rating. 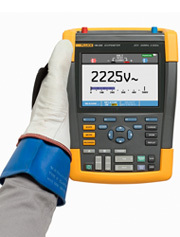 Fluke ScopeMeter test tools are ideal for service, installation, or maintenance tasks on industrial electronics, electrical machinery, or control systems. Why Are These Oscilloscopes Different? Oscilloscopes are tools that extend electrical or electronic troubleshooting techniques by providing a clear picture of what an electrical signal looks like. By visually analyzing the waveform you can instantly see common signal disturbances like noise, distortion, or transients. 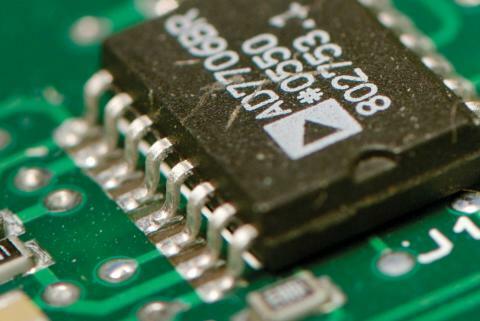 Closely inspecting the waveform over the amplitude or time domain can reveal errors like signal attenuation, fluctuation, drift, or even unwanted offsets and jitter. Capturing and assessing the extent of these anomalies is the first step in diagnosing an electrical system failure. The ScopeMeter models feature deep memory - up to 10,000 samples per channel - so you can examine very small parts of the waveform in detail. The Fluke ScopeMeter oscilloscopes are the industry standard for portable, safe, and rugged oscilloscopes. They combine a sealed case that is dust proof and drop proof, tested in accordance to IP51, with a design that is tested to withstand 3g vibration or 30g shock. Popular enhancements in the new 190 Series II include extended battery life, hot-swappable batteries, and a higher safety rating. The ScopeMeter operates for up to 4 hours with a 2400 mAh Li-Ion pack (standard with 4-channel models; optional for the 2-channel models). The battery door makes it possible to quickly swap in a fresh charged battery. Independent electrically isolated inputs safety rated to CAT III 1000 V / CAT IV make it safe for engineers or technicians to measure everything from low voltage control signals all the way up to a 3-phase main power supply. The ScopeMeter 190 Series II is available in 200 MHz and 100 MHz, either 2 or 4 channel, plus an additional 2 channel 60 MHz model. With up to 2.5 GS/s sampling rate and deep memory of up to 10,000 sample points per input, the new 190 Series II will capture and display just about any waveform or waveform anomaly. With two electrically isolated USB ports, users can conveniently store data to a USB memory device or easily connect to a PC and transfer waveforms or screen images for data analysis or archiving. Which Plant Maintenance and Field Service Applications? Technicians and engineers use these portable oscilloscopes for a wide range of plant maintenance and field service applications - from installation and commissioning to maintenance and troubleshooting of industrial, electro-mechanical, process, and automation electronics; medical imaging equipment; and communications and avionics systems. 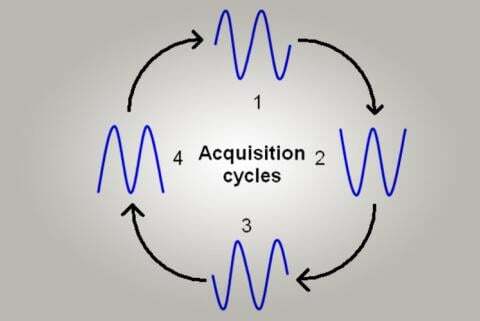 With the increase in both robotics and co-gen systems, many industrial facilities now require the capability of capturing, displaying, and diagnosing amplitude, time, wave shape, or disturbance-related problems on signals from motor controls, programmable logic controllers, power supplies, inverters, actuators, sensors, and encoders.